Boil chopped Onion, beetroot, green chili, Tomato and Toor dal for a whistle or two. Add two cups of water, salt and allow it to boil for 2 to 3 minutes. 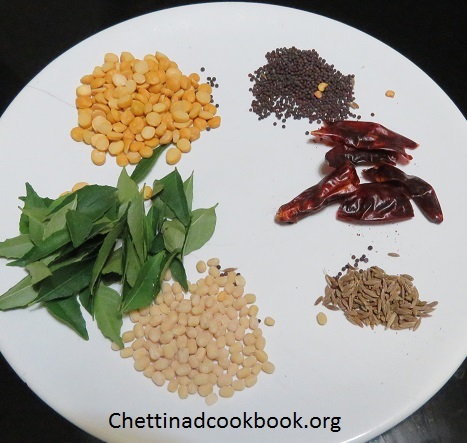 Season it with Fennel seeds, cumin seeds, and curry leaves. 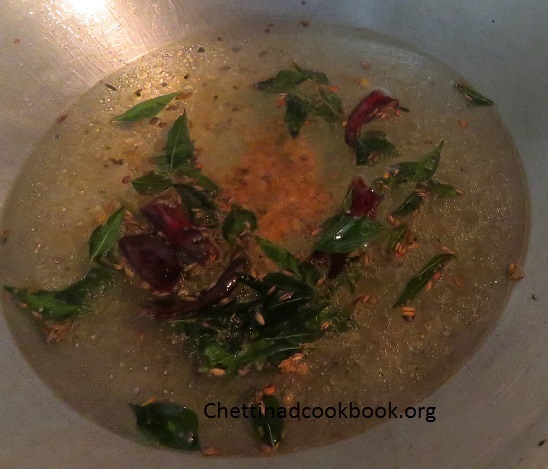 Season with Bay leaf, cumin, pepper and a pinch of garam masala powder. Finally, add few lemon drops and a tablespoon of coconut milk. Beet fiber helps to reduce cholesterol and triglycerides by increasing the level of HDL (good) cholesterol. Having a high level of triglycerides increases the risk for heart-related problems, so an increased HDL is a good line of defense against that. The presence of the nutrient betaine lowers the levels of homocysteine in the body which can also be harmful to the blood vessels. Thus, consumption of beetroot helps to prevent cardiovascular diseases in multiple ways, so conditions like atherosclerosis, heart attacks, and stroke are less likely to develop. The fiber in beets also works to strip excess LDL cholesterol from the walls and helps to eliminate it from the body quickly. Beets are good for pregnant women since they are a source of B vitamin folate which helps in the development of infant’s spinal column. Deficiency of folate can lead to a variety of conditions called neural tube defects. Studies have revealed that beets are good at preventing skin, lung, and colon cancer since they contain the pigment betacyanins, which counteracts cancerous cell growth. Nitrates used in meats as preservatives can stimulate the production of nitrosamine compounds in the body which can also result in cancer. Studies have now shown that beet juice inhibits the cell mutations caused by these compounds. Researchers in Hungary have also discovered that beet juice and its powdered form slows down tumor development. Adding a healthy amount of beets to your diet can keep your body cancer-free for a very long time. Betaines in beet juice stimulate the functions of the liver and keep it healthy. Beetroot is a source of vitamin C that helps to prevent asthma symptoms. The natural beta-carotene in beetroot also helps to prevent lung cancer. Vitamin C is a powerful antioxidant that boosts the immune system in a number of ways. Besides acting as an antioxidant itself and defending against the effects of free radicals in the body, it also stimulates the activity of white blood cells, which are the body’s main line of defense against foreign bodies, as well as viral, bacterial, fungal, and protozoan toxins that can result in a multitude of infections and illnesses. The presence of beta-carotene, which is a form of vitamin A, helps to prevent age-related blindness called cataracts as well as a reduction in macular degeneration that commonly occurs as we get older. Vitamin A is considered a powerful antioxidant substance that is involved in many essential activities of the body. The flavonoids and vitamin C in beets help to support the structure of capillaries. 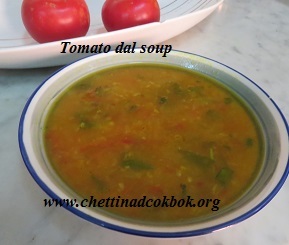 Healthiest Innovation in our traditional recipe. 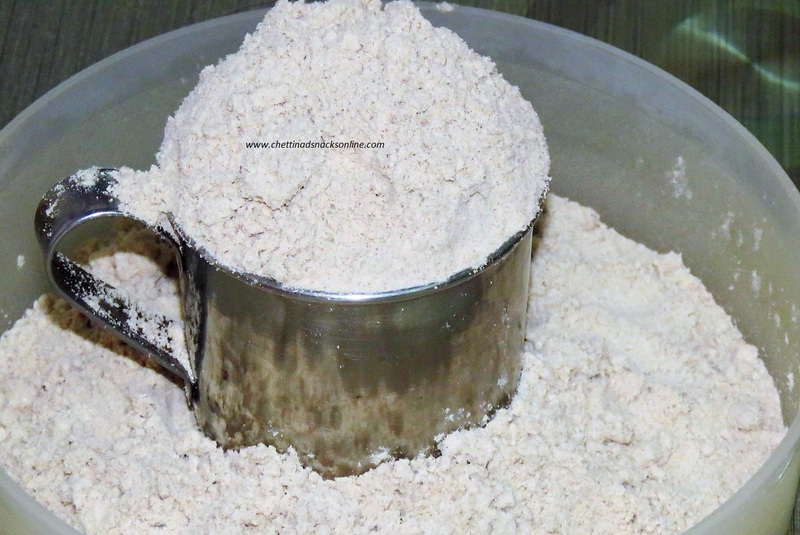 Kozhukkattai is traditionally made with rice flour as a base and filling prepared in various combinations, including spice and sweet. 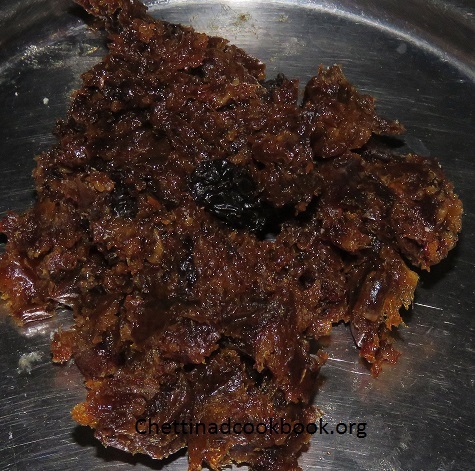 Here, I thought to prepare something healthier to consume and without any artificial sweet or sweets like sugar and jaggery. Dates are naturally sweet in taste and the crunchy nuts added are very healthy. 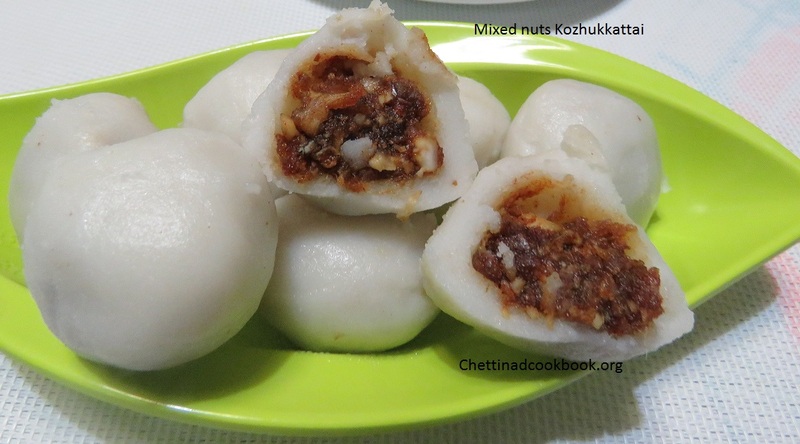 This wonderful combination of nuts and dates, filled in rice pod is heavenly in taste. 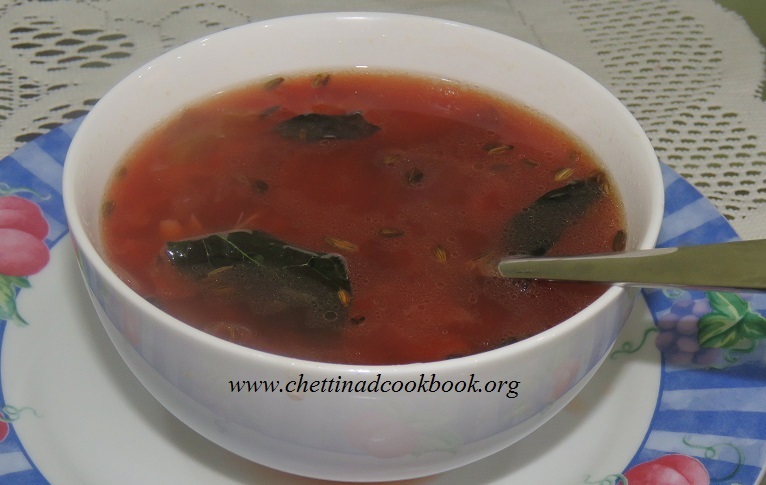 Exclusively prepared for this Ganesh Chathurthi, recipe from Chettinadcookbook. 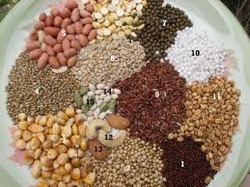 Coarsely grind all the above-mentioned nuts in a mortar or pestle, collect it separately. Grind the dates and dry grapes together for a minute to mash it well. 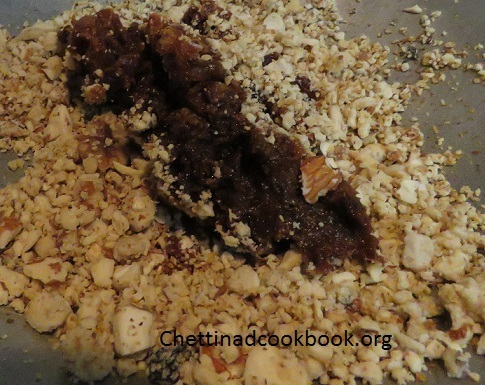 Heat pan with one teaspoon of ghee and slightly roast the nut mixture. 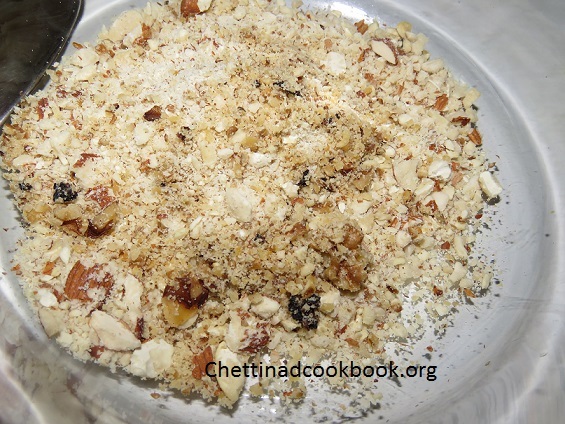 In a wide pan add roasted nut mixture, dates mixture, and coconut. 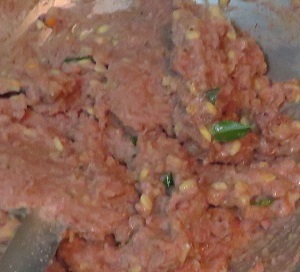 Mix it well all together and make it into a small gooseberry sized balls. In a vessel boil water, take another pan to add the rice flour, salt, and oil as mentioned above. 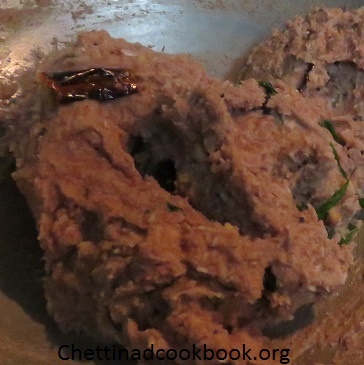 Gradually pour boiling water into the rice flour and mix it with the ladle to a tight dough. 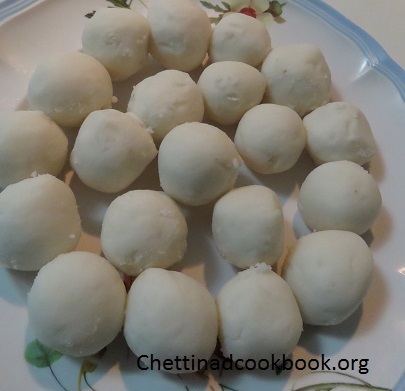 Make the dough to small lemon size equal balls, Now grease your fingers and palm, make the balls to thin patties or cup-shaped to fill the mixture. Make it to your desired shape, such that the filling does not come out of the outer covering. 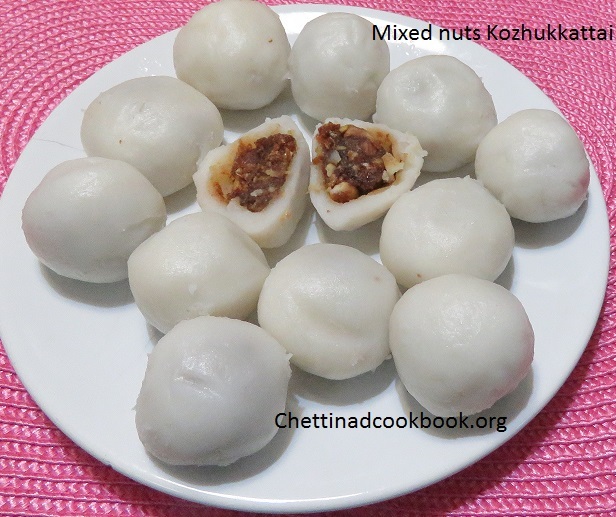 Steam cook the Kozhukkattai, in two batches for 10 to 15 minutes. 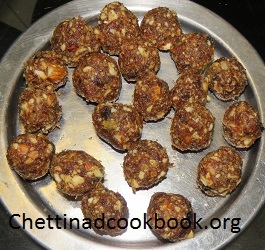 Mixed nuts Kolukkattai is ready. 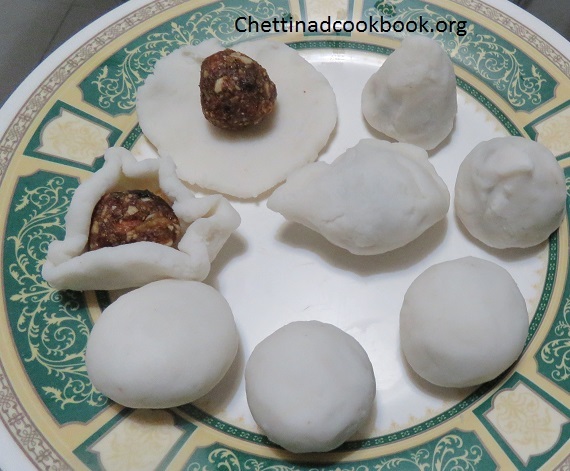 Exclusively prepared for this Ganesh Chathurthi from Chettinadcookbook. 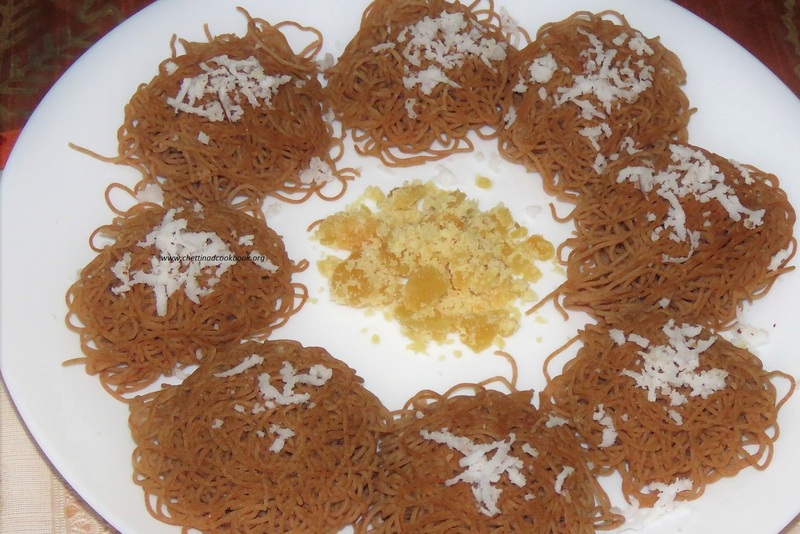 If you prefer to have a more sweet taste, add some grated jaggery with the mixture. 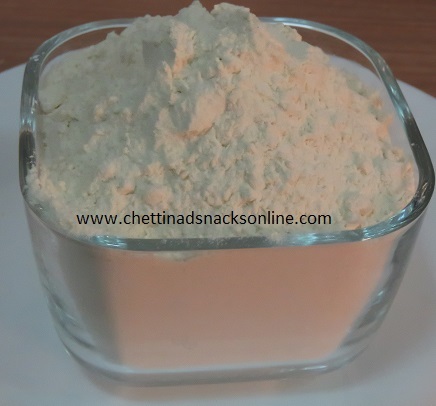 One teaspoon of sugar can be added in rice flour while mixing the dough. 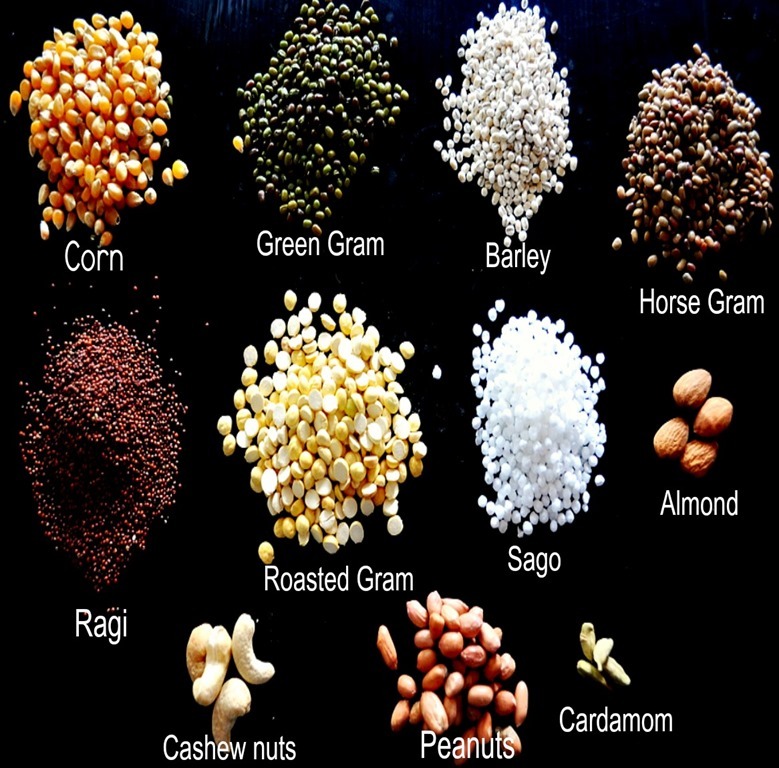 Most of the ingredients are in the same measurement except, Badam, cashew, dry ginger, and cardamom. according to your choice, you can choose ingredients from below and skip which you do not prefer. This is Infant to Adult recipe. Homemade is always best when we compare with store-bought foodstuff. More hygienic, quality and quantity. Spread the roasted ingredients on a clean cloth. When it reaches room temperature. 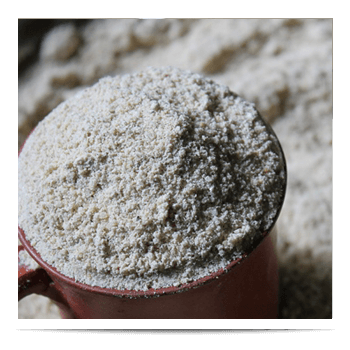 When it reaches room temperature, grind it in the mill to a smooth flour. Store it in a clean container this can be used or 5 to 7 months. 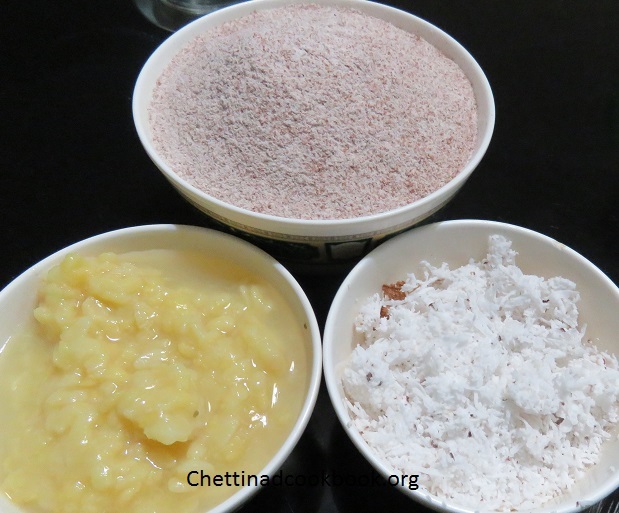 Porridge, puttu, sathumavu, and idiyappam can be made by using this health mix.